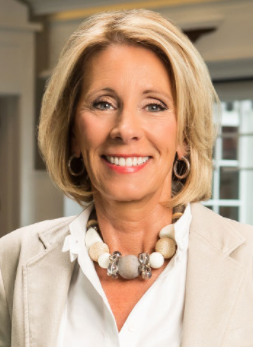 The Oklahoma Federation for Children Action Fund has received more than $180,000 from its Washington-based parent organization, American Federation for Children, which DeVos chaired. DeVos has personally given almost $900,000 to the national federation’s related entities since 2012, according to a disclosure submitted to the U.S. Senate Health, Education, Labor and Pensions Committee in advance of her confirmation hearing, scheduled for Jan. 17. The Oklahoma Federation for Children Action Fund has reported spending more than $190,000 in local races since Jan. 1. DeVos’ nomination has sparked controversy because of her long-time support of school-choice policies, with teachers unions and others warning she will push for changes that privatize public education and undermine public schools. • $11,509 to oppose Lloyd Snow, a former Sand Springs superintendent who lost a bid for a seat in the state Senate in District 37. • $3,177 opposing Don Wentroth Jr., a retired teacher who ran for House District 100 in Oklahoma City and lost to incumbent Elise Hall. • $22,788 to oppose Lisa Kramer, a Bixby school board member and CPA whose platform included elevating the value of and promoting the profession of teaching to solve the teacher shortage. Kramer, a Republican, lost to businessman Joe Newhouse in Senate District 25. • $2,489 to support Sen. Rob Standridge, who won re-election in District 15 over opponent Shawn Sheehan, a Norman educator and 2016 Oklahoma Teacher of the Year. • $3,156 to support Sen. Kyle Loveless, who defeated a Mustang high school teacher in the primary, and ran unopposed for re-election in District 45. Loveless is a school choice proponent. • $13,611 to support Joe Newhouse, who supports expanding school choice through tax credits. He defeated teacher caucus candidate Robert Founds. • $7,165 to support Julie Daniels, a Bartlesville Republican who won a seat in the Senate representing District 29 and supports education savings accounts for all parents. She defeated teachers’ caucus candidate Robert Jobe, a retired teacher. • $7,039 to support Tim Downing, a Republican who defeated Blanchard Public Schools Superintendent Jim Beckham in the primary and teachers’ caucus candidate Liz George, an attorney, in the general election. The PAC’s latest report was filed Nov. 7. Quarterly reports covering Oct. 1 through Dec. 31 are due on Jan. 31. In this August 2015 video produced by Fort Lauderdale-based law firm Trip Scott, Betsy DeVos talks about the American Federation for Children’s efforts to promote school choice.